1.1 "A Women’s Place is in the Struggle"
4 "RSCC Study: The CUNY Student Struggle, Then and Now"
8 "PACK THE COURT: DEFEND THE CUNY6, KHALIL & TAFFY"
12 "Join the Youth and Student Contingent for May Day"
13 "LEFT FORUM: The Student Movement in NYC"
17 "Abolish The Board of Trustees, CUNY Must Be Free!!!" 18 "Refugees welcome! Fascists are not!" 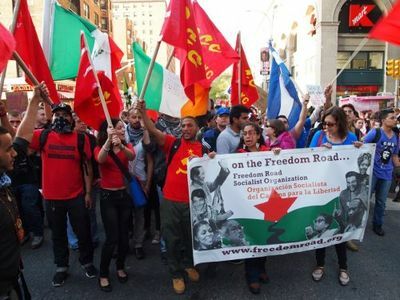 Revolutionary Student Coordinating Committee (RSCC) was founded in February 2012 as an organization uniting revolutionary-minded youth and students throughout the CUNY system in NYC. It is politically united based on its Points of Unity, works for the attainment in CUNY of its Platform, and operates according to its Constitution. In New York, Freedom Road... mostly works through a front group called the Revolutionary Student Coordinating Committee (RSCC). In the beginning Revolutionary Student Coordinating Committee worked closely with IGNITE, the Maoist collective of Freedom Road Socialist Organization. Revolutionary Student Coordinating Committee was formed by members of IGNITE along with other comrades throughout the NYC area. RSCC is a political formation that does work primarily around the issue of white supremacist imperialist control of the educational system, and how that serves to disarm black and brown working class people people politically by erasing and distorting our peoples’ histories. Currently the majority of the public school system offered to kids in the hood serves the purpose of day-prisons for kids and teens. We must struggle to take control of the schools and transform them from mechanisms of oppressive social conditioning into factories of liberation. Ideology is a weapon, liberate the schools! "A Women’s Place is in the Struggle"
"A Women’s Place is in the Struggle: A Report back on the Women Against Imperialism! Panel"
March 21 2013, three "outstanding women organizers", Bernadette Ellorin of Bagong Alyansang Makabayan-USA or New Patriotic Alliance-USA (BAYAN-USA), Monami Maulik of Desis Rising Up and Moving (DRUM), and Lamis Deek of Al-Awda New York, The Palestine Right to Return Coalition, spoke at CUNY John Jay College. The panel was moderated by Fernanda Pardo, a member of Revolutionary Student Coordinating Committee and the Women’s Workteam of RSCC. The event was sponsored by the Women’s Workteam of Revolutionary Student Coordinating Committee and IGNITE. The Red Guards - Los Angeles) are affiliated with the Progressive Youth Organization based Kansas City Missouri and to the Revolutionary Student Coordinating Committee of New York City and Revolutionary Student Coordinating Committee, PHL. All are affiliated with the Liaison Committee for a New Communist Party. NEW YORK CITY – CUNY students call for a protest picket on the afternoon of Monday, June 25 outside the regular meeting of the CUNY Board of Trustees, when the Board will give massive pay raises to CUNY administrators, including a quarter-million dollar pay raise (54%) to Chancellor Goldstein. CUNY is denying admission to more and more Black and Latino students based on its so-called rising "academic standards," while Baruch College's Zicklin School of Business was recently caught fixing the grades of failing students who work for Wall Street firms. CUNY uses one set of "academic standards" to deny admission to working-class Black and Latino students and fudges another set of "academic standards" for Wall Street executives whose tuition is paid for by their firms. Despite these twin scandals, the paper-pushing non-producing parasites on the Board are planning to congratulate administrators with outrageous salary increases on June 25. Join the Revolutionary Student Coordinating Committee on June 25 to protest against these outrages! "RSCC Study: The CUNY Student Struggle, Then and Now"
Columbia University - Intercultural Resource Center (552 W 114st st by Broadway) Sunday 1 December 2013, organized by Revolutionary Student Coordinating Committee. The Fall 2013 semester has seen the revival of militant student movements in CUNY. Our movements are following in the footsteps of those who struggled in CUNY before us, in the 60s, 70s, 80s and 90s. The struggles of the past opened up CUNY to oppressed people, but that is not the end of the story, it was only the first step. The struggle of our generation is going to be to seize CUNY for the people. In order to do that we must study the past. RSCC is taking up this task by hosting a study on the history of revolutionary student movements in CUNY, to enrich our struggles going forward. Come out and learn with us, as we build towards a CUNY Spring! Those indicating their intention to attend on the Wherevent website notice of the event included Amity Magid Paye, Ayisha Irfan, Yexenia Vanegas, Shaira Chaer, Hoda Mitwally, Emily December, Emily Wynter , Stephanie Zukasaka, Sherry Cruz, Natalie Wells, Jenny Marks, Angelica Hernandez, Analisa Svehaug, Marcia Esparza, Marisa Jalo, Gargi Padki, Aber Kawas, Maha Chielo, Narish Singh, Erick Moreno, Rey Valentin, Carlos A. Rivera-Jones, Kevin Kang, Jose LaSalle, Tafadar Sourov, Khalil Vasquez, Christian Laureano Peruyero Bracero, Matt Peterson. On October 28, 2013, a City College administrator suspended Tafadar Sourov and Khalil Vasquez, two students who led demonstrations against the administration’s illegal raid and seizure of the Guillermo Morales / Assata Shakur Community Center. The Morales / Shakur Center is a space that has existed at City College for more than 20 years and was first won in 1989 through a mass student strike and occupations throughout CUNY. On November 8, Taffy and Khalil will come before the faculty-student disciplinary committee for the first time. The City College administration, and the ruling class they serve, is attempting to squash political dissent on campus by targeting two of the most prominent and uncompromising organizers in today’s CUNY movement. Taffy and Khalil are members of the Revolutionary Student Coordinating Committee. In addition, Taffy is the secretary of CCNY Students for Justice in Palestine. Khalil is also a former leader of the CCNY Black Student Union. In response to the attacks on our student leaders, students and community say: WE ARE NOT AFRAID. Repression will not end the campaign to save the Morales / Shakur Center or the broader struggle to liberate CUNY for the people. Hundreds on campus and in the community will follow their example. Any punitive measures against Taffy and Khalil will only be a lesson to the people that the CCNY administration dismisses the people’s concerns and that the people must escalate their mass actions. Taffy and Khalil are fighting for the people, defending the last autonomous campus space that serves the community and defending the legacy of the people’s revolutionary heroes. THE PEOPLE MUST DEFEND TAFFY AND KHALIL. The people cannot stand aside and look as the City College administration attempts to isolate them and promote fake sellout student leaders who want to negotiate away the Center. The Center was won through struggle and will be reclaimed through struggle. Six demonstrators were arraigned Wednesday September 18, 2013 in Manhattan Criminal Court after a protest against ex-C.I.A. chief David Petraeus at the City University of New York got ugly. About 75 people were marching on the sidewalk outside of Macaulay Honors College at 35 W. 67th St. on Tuesday when a fight broke out with cops, according to the criminal complaint. Jose Disla, 25; Augustin Castro, 23; Denise Ford, 24; Angelica Hernandez, 18; and Rafael Pena, 24; were charged with obstruction of governmental administration, riot, resisting arrest and disorderly conduct. But attorney Lamis Deek said the group had been peaceful. CUNY student Luis Henriquez, 25 claims he was struck by cops while protesting. Those indicating support or attendance on Wherevent, included Billy Harding, Victoria Sobel, Brian Scott, Angelica Hernandez, Jed Brandt, Lamis Deek, Hilary Weisz, Jenny Marks, Nana Tenten, Tajh Danielle Sutton, Nandina Vondza, Ben Becker, Tommy Maggio, Jose LaSalle, Five Omar Mualimmak, Marcel Cartier, Sumumba Sobukwe, Kwame Shines, Greg Butterfield, Laura Ann Denies, Rakim Jenkins, Saswat Pattanayak, Amira Aganovic, Nkem Ejoh, Emmanuel Pardilla, Ibra Kaypa, Sherland Kellman, Nerdeen Kiswani, Stephanie Zukasaka, Julia Wallace, Juan Caina , Abe Walker, Rndl Rzz, Dezmond Goff, Karla Tequila, Shape Imtiaz, David Suker, Nadia Zaid, Charlotte Kates, Khalil Vasquez, Kevin Dwyre, Youssef Tlili, Yoko Liriano, Ja Len, Lucy Parks , Tom Watts, Jane Brennan, Nicholas Lochan, Ryan McNamara, Juan Alberto Perez Vera, Prachi Patankar, Ben Fredericks, Kevin Kang, Fanshen Wong, Mustafa Sullivan, Sonny Obhan, Shaka Salahudin Shakur, Jackie Maegan, Abdu Salman, Chrissie O'Heron, Nicky Boats, SlabTzu DelFuego, Arman Azimi, Juan Colmenares, Elliot Vazquez, Justin T. Watson, Syed Raza, Brad Sigal, Angelica Molina, Amin Husain, Rafael Pena, Selina Beckford, Gague Lacharite, Chrissi Fabro, Larry Hales, Moneek Moheeka, Thomas Sharkey, Tovia Ben Shapiro, Tafadar Sourov, Ali Nasser, L. L. Eljeer Hawkins, Marybeth Seitz-Brown, Ruth Perez-Chaves, Andres Ibanez, Christopher L. Lopez, Eduardo Viera, Imani Brown, Fernanda Pardo, Rey Valentin, Francisco Fortuno Bernier, Viviana de Jesus, Elisa Lorde, Ev Er In, Michael Snyder, Ramsey Lovesramen , Dylan Farley, Miguel Peralta, Jr., Timothy Connelly, James Bud Grainger, Johnathan Vivar, Nilesh Vishwasrao, Stanley Fritz, Douaa Sheet, Michael Letwin, Eric Struch, Kadeem Panelle Trammell, Carlos Rivera, Catherine-Mercedes Brillantes Judge, Analisa Svehaug, Roksana Mun, Bryant Brown, Julian Roberts, Mohammed Ezzeldin, Jeff Camp, Graciela Razo, Lisa Monae, Marisa Dos Santos, Amity Magid Paye, Gimbels Elizabeth Dayton, Gregoire Jacques, Rima Isam Anabtawi, Shay Horse, Jason Harris, Siervo Del Pueblo, Dorlimar Lebron Malave, Terance Podolski, Yves Nibungco, Alexandra Schindler, Lisa Wojehowski, Magdolyn Kawas, Alok Vaid-Menon, Jose Angelo Mikhail, Lolan BuSe, Freddy Bastone, Shondrea Thornton, Yasmin Majeed, Nisha Adarkar, Lawrence Lan, Helen Panagiotopoulos, Annie Vargas, Veronica Feliciano, Karla Alejandra Reyes, LaMont OyeWale' Badru, Katherine Michelle Abreu, Luis Henriquez, Emily Wynter, Elif Fatıma Gorken, Angelica Clarke, Justina Nicole, Junior Langit, Sharrae Lyon, Noran Elzarka, MJ Zapata, Aber Kawas, Vanessa Calle, Sharmin Hossain, Hoda Mitwally, Molly Bhuiyan, Alice Feng, Mateo Guerrero-Tabares, Nastaran Mohit, Asha Rosa. "PACK THE COURT: DEFEND THE CUNY6, KHALIL & TAFFY"
100 Centre Street, New York, Thursday 9 January 2014, organized by Revolutionary Student Coordinating Committee, "PACK THE COURT: DEFEND THE CUNY6, KHALIL & TAFFY". The CUNY 6 and Khalil and Taffy have open criminal cases with ongoing court appearances. All 8 students are set to appear in court on January 9th, 2014 at 9:00 am, at 100 Centre Street. We call upon all students, faculty, and members of the community to come out and pack the courts on January 9th in support of the CUNY 6 and Khalil and Taffy. 2 W 64th St,New York 29 October 2014, 17:30 -19:30. Organized by : Revolutionary Student Coordinating Committee. Last year students were suspended, a community center was illegally shut down and the City College campus turned into a police-run campus in order to suppress the movement led by CUNY students and faculty to drive ROTC and War Criminal David Petraeus out of our university. Now the Macaulay Honors College is inviting him to speak. Let's be there to let Petraeus know that CUNY rejects imperialism and its war criminals! Many students an others indicated they would attend on the Whenever page advertising the event. They included Sharmin Hossain, Angelica Hernandez|Angie De LaGhetto, Nerdeen Kiswani, Zeina Alturk, Mila Lebron, Avia Michelle, Monique Thompson, Dalilah Freeman, Meli LaSalle, Coche Bomba, Shohag Ahmed, Donnie Donilon, Hasan İncedere, Michael Bellamy, Katrina Cortes, Sabin Rene Figaro, Thalmann Pradeep Pereira, Myles Glynn, Daniela Robles Martínez, Ayumila Hilai, Khalil Antonio Vasquez, Jeff Camp, Ateo Laureano Bracero Peruyero, Erick Moreno, Scott Williams, Bernadette Ellorin, Susie Abdel, Dan Cione, Abdu Salman, Percy Lujan, Rajib Lovesramen Miah, Vishal Singh, Avia Michelle, Marc Durougeot, Christopher Rieth, Rayn Cornielle, Louis Oprisa, Mike Legaspi, Bayu Patria, Merlin Miano Patramani, Shake Zula, Sabiha Azad, Jan Makovec, Josmar Trujillo, Kjell Gunnar Larsen, Shandell Is, Jasper Washa, Richard Finkelstein, Jared Flanery, Jose LaSalle, Behrooz Navaii, Alexi Shaaloom, Nick Maniace, Rey Valentin, Uthkarsh Dev, Owsspag Apollo, Rani Ghosson. Revolutionary Student Coordinating Committee Retreat 2014. We are preparing for a new semester during which we will advance the struggle to liberate CUNY for the people, and transform it into a base area for revolutionary struggles for liberation!! — with Leon Joseph, Jan Makovec, Shake Zula, Tafadar Sourov, Erick Moreno, Moneek Moheeka, Miguel Makata, Meli LaSalle, Khalil Vasquez, Angelica Hernandez|Angie De LaGhetto, Asha Cameron, Persi D Lacan, Marisa Dos Santos, Amanda Meltzer, Ezra Sholom and Odochi E. Ibe. Revolutionary Student Coordinating Committee organized an event "RSCC Fundraiser and Open Mic - Three Years in the Struggle" at Picture the Homeless, 104-106 East 126 Street, Saturday 28 February 2015. For three years now, the Revolutionary Student Coordinating Committee(RSCC) has been serving the needs of oppressed nationality people of NYC by working toward the liberation of CUNY. We want CUNY, an institution which puts the interests of the state before the needs of the majority of NYC's population, working class people, to become bases for revolutionary struggles inside and outside the university. Those indicating support or attendance on Wherevent included Lisa Gagliardo, Nicole Bugarin, Suzanne Bjorndal, Sankofa Taylor, Percy Lujan, Khalil Vasquez, Rajib Lovesramen Miah, Omar Rashid, Tafadar Sourov, Dan Cione, R-naby Shuma , Juan David Lopez Velez, Corey Uhl, Carlos A. Taveras, Jr., Jim Byrne, Marisa Dos Santos, Archer Sackey, Jon Laks, Angelica Hernandez|Angie De LaGhetto, Rockey Meitei Saphaba, Katrina Cortes, Rani Ghosson, Nizum Khan, Richard Finkelstein, Kenneth Fuglemsmo. International Working Women's Day Panel, Hunter College West Building Cafeteria (Green Room), Wednesday 11 March 2015. Join us March 11th to discuss “What women’s liberation means to you? Organizers from different youth organizations Students for a Democratic Society at Hunter College, Students for Justice in Palestine at Hunter College, Revolutionary Student Coordinating Committee, The Ya-Ya Network, and Anakbayan NY will speak on a panel celebrating International Women's Day and discuss what Women's Liberation looks like to their respective organizations and their political lines. Many students an others indicated they would attend on the Whenever page advertising the event. They included Neda Kit, Medina Beqiri, Michelle Natanzon, Farah Rah, Tanha Tabassum AlSheikhdallah , Zayneb Almiggabber, Mila Lebron , Archer Sackey, Belal Bahader, Sean Kennedy, Omar Rashid, Zeina Alturk, Don Tagala, Salma Ismaiel, Aatika Al Bashir, Richard Finkelstein,Ashley Ngozi Agbasoga, Percy Lujan, Zeina Alturk, Tafadar Sourov, Leon Joseph, Jessie Sander, Angelica Hernandez|Angie De LaGhetto, Noran Elzarka, Lisa Gagliardo, Meli LaSalle, Rockey Meitei Saphaba, Eman Youssef, Narish Singh, Polilla Ramirez, Lara Maher, Izabela Qafa, Samer Khawaja, Irving Apantenco, Yousr Shaltout, Arlene Cornejal, Mike Legaspi, Sankofa Taylor, Avia Avia, Katherine Azcona, Dan Cione, Jon Laks, Erick Moreno, Rey Valentin, Rani Ghosson. Revolutionary Student Coordinating Committee organized a "Summer Open Mic" session at Picture the Homeless 104 East 126th Street New York, Saturday 11 July 2015, 18:00. This summer, RSCC is taking up the struggles of anti-police brutality, anti-gentrification, and immigration work primarily in communities in the Bronx, Harlem, Queens, and Brooklyn. Our days have been spent talking to high school students, giving talks on trains, performing cop-watch patrols, conducting studies and workshops, organizing and attending protests, and so much more. As a revolutionary student organization, it is our duty to fight for our people; this means that when we fight to liberate CUNY, we're not just looking out for the students, we're looking to create a base for revolutionary struggles to happen in our communities. Therefore, it is also our duty to take the fight straight to our neighborhoods and serve the people! We want everyone to support and join us in the months to come. Join us for a night of revolutionary culture through music, dance, poetry, spoken word, raffle prizes, and art. The floor is open to anyone who wants to perform. Those indicating support or attendance on the event's Whenever page included Angelica Hernandez|Angie De LaGhetto, Lesh Vishwasrao, Felicia Castaldo, Meli LaSalle, Thasfia Chowdhury, Javal Ghalil Minor, Richard Finkelstein, Ibrahim Asad Siddiq, Far Han, Stephanie Zukasaka, Dakem Roberts, Nicole Fontan Sanchez, Ace LaBeija, Dan Cione, Sean Kennedy, Enbion Micah Aan, Daniel Carrillo, Rajib Lovesramen Miah, Achmat Akkad, Zishun Ning, Paul Funkhouser, Jon Laks, Michael Barber, Evan David, Jan Makovec, Miguel Rodriguez, Sankofa Taylor, Jasmine Abdelhady, Sonny Obhan, Xsavier Daniels, Albert A. Smith, IV, Nerdeen Kiswani, Yhamir Chabur, Josmar Trujillo, Ana Guillcatanda, Cathy Rojas, Shake Zula, Dave Uog, Khalil Vasquez, Daniel Gibbons, Percy Lujan, Erick Moreno, Jushima Peteso Elba, Tammie Marie David, Salma Ayai, Archer Sackey, Kim Morales, Daniel Dunn, Carah Naseem, Krutika Desai, Lauren Wilfong, Sharice Richards, Clayton Nino Brown , Rey Valentin, Eva Nidzeeva, Rachel J. Chapman, Nizum Khan, Maureen Silverman, Epiphany Epiphany, Ashley Ngozi Agbasoga, Rebecca Hensley, Nicole Bugarin, Jose Ponce, Tony Polanco-Bethancourt, Katie Merriman, Jamie Diamond, Fritzi Fredericka DeBeer Charno, Arlene Cornejal, Lisa MacDonald, Sophie Warren, Donnay Edmund, Marlo Jones, Katrina Cortes, Alexia Garcia, Stephanie Villeda, Narish Singh, Michelle Natanzon, Talii Malik, Katherine E. Vasquez, Kiara Chandler, Adelita Karla Cambio. Wednesday 26 August 2015, Revolutionary Student Coordinating Committee organized an "RSCC LGBTQIA Study" event. Our position as Revolutionary Student Coordinating Committee is that there is no such thing as People’s Liberation without Queer and Trans Liberation. We see all forms of oppression as rooted in the Class Struggle and therefore to have a Class Analysis in understanding the oppression that extends to the issues and concerns of Queer and Trans peoples is the path to defeating and destroying Patriarchy. "Abolish The Board of Trustees, CUNY Must Be Free!!!" BARUCH COLLEGE VERTICAL CAMPUS, at 55 Lexington Avenue (corner of 24th Street), New York, New York. Monday 16 November 2015, Revolutionary Student Coordinating Committee organized an "RSCC LGBTQIA Study" event "Abolish The Board of Trustees, CUNY Must Be Free!!!" Those indicating their support or willingness to attend, on the event's Wherevent webpage included Karen Abraham-Garcia, Izzy Peace, Rawan Toom, Terrie Chandler, Nerdeen Kiswani, Jasmine Abdelhady, Michelle Natanzon, Daisy Villalobos, Carla Hernandez, Adam David Riordan, Thomas Thomas, Daniel Dunn, Tafadar Sourov, Akash Rahman, Rajib Lovesramen Miah, Javal Ghalil Minor, Zakaria Ismail Kronemer, Jeremy Randall, Jon Laks, Omar Rashid, Dan Cione, Daniell RK MarleMao. "Refugees welcome! Fascists are not!" Tuesday 24 November 2015, Revolutionary Student Coordinating Committee organized an "Refugees welcome! Fascists are not!" forum. Those indicating their support or willingness to attend, on the event's Whenever webpage included Daisy Crispin, Omar Rashid, Daniel Dunn, Yhamir Chabur, Tafadar Sourov, Rayn Garden, Daniell RK MarleMao, Merv Blue, Luis Henriquez|Viejo Chuleta, Percy Lujan, Jacqueline Mendoza, Dan Cione, Sara Mustard, Greg Butterfield, Sam Aldailam, Ev Er In, Akram Guzman, Nizum Khan, Joe Catron, Jon Laks, Hasan İncedere, Sabin Rene Figaro, Marvin Balthezar, Dakem Roberts, Nerdeen Kiswani, Shirley Lopez, Kai Yang, Talii Malik, Fernanda Pardo, David Suker, Savanna Young-Jarboe. Saturday 16 January 2016, organized by Revolutionary Student Coordinating Committee - RSCC Fist Up Fight Back NightShow, at Families for Freedom- 35 W. 31st Street New York. Those indicating their support or willingness to attend, on the event's Whenever webpage included Riha Nath, Shake Zula, Christian Almonte, Melody Gonzalez Diaz, Khush Kam-Au, Sabin Rene Figaro, Percy Lujan, Miguel Rodriguez, Tafadar Sourov, Travis Brown, Kevin Kang, Jade Valentina, Marisa Dos Santos, Michelle Natanzon, Tanzeem Shaneela, Meli LaSalle, Blake Winters, Jensine Sultana, Narish Singh, Dee Medellin Szsz, Shaktii Shaktii, Akin Haynes, Lenin F. Salazar, Khalil Vasquez, Jon Laks, Claudia Palacios, Kassem Nasser, Aldo Rafael Perez, Katrina Cortes, Nizum Khan, Danna Yessenia Mendoza Romero, Daniel Dunn, Alan Torres, Bunny Juarez, Regina Joseph, Aisha Ace LaBeija, Yaeli Flam, Shanise Simmonds, Joe Catron, Jan Makovec, Javal Ghalil Minor, Alexandra Leston, Daniell RK MarleMao, Robert Lorenzo, Sol Borja, Xsavier Daniels, Ramsey Lovesramen, Ajay Henderson, Tyler Albertario, Freddy Gee, Katherine Vasquez, Kenia Rodriguez, Hancy Martinez, Rey Valentin, Adam Koren-Roth, Sara Mustard, Karen Abraham-Garcia, Cathy Rojas, Nicole Bugarin, Kim Morales, Margaret D'Poet, Carol Karimah, Nicole Komissarenko, Akash Rahman, Daisy Crispin. Attendees of the First Day of the January 2016 Revolutionary Student Coordinating Committee Winter Retreat included Jon Laks, Melody Gonzalez Diaz, Ramsey Lovesramen, Karen Abraham-Garcia, Daisy Crispin, Omar Rashid, Michael Bellamy, Nicole Bugarin, Far Han and Meli LaSalle. ↑ "A Women’s Place is in the Struggle: A Report back on the Women Against Imperialism! Panel"
↑ Wherevent "RSCC Study: The CUNY Student Struggle, Then and Now"
↑ "Abolish The Board of Trustees, CUNY Must Be Free!!!" ↑ Wherevent Refugees welcome! Fascists are not! ↑ FB Revolutionary Student Coordinating Committee January 22 ·First Day of the RSCC Winter Retreat COMPLETE! This page was last modified on 21 September 2018, at 13:51.